In recent weeks I’ve been exploring the probate records for various Saunders County, Nebraska ancestors. How about a probate record from Sweden? I didn’t even know these types of records existed until a few months ago. I learned more about them at the Lindsborg workshop. Sweden passed a law in the 1700’s that required that a deceased person’s estate be inventoried upon their death. There were special exceptions depending on which spouse died first, or if the person was so poor they didn’t own anything. And not all estate inventory records have survived. I haven’t done a thorough search by any means for all of the estate records that might be available for my ancestors. But I did find one for the Rudeen side of the family! Gust’s grandfather Johannes was the first to move his family to the Eket farm in 1835 and Gust’s father Peter Anders was 10 years old at the time. Eventually, Johannes and his wife Maria (sometimes Maja) had three sons and five daughters. In 1854, Gust’s parents Peter Anders and Anna Greta were married. They took over the farm at Eket while Johannes, Maria and the two youngest daughters moved to the nearby Carlstorp “backstuga” (one of the other daughters had died, and the rest of the kids had already moved away from home). 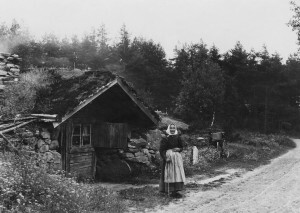 A backstuga is a type of farm dwelling that was common in rural Sweden. It was typically partially dug into the ground on a hillside and was often where poor or retired people lived. 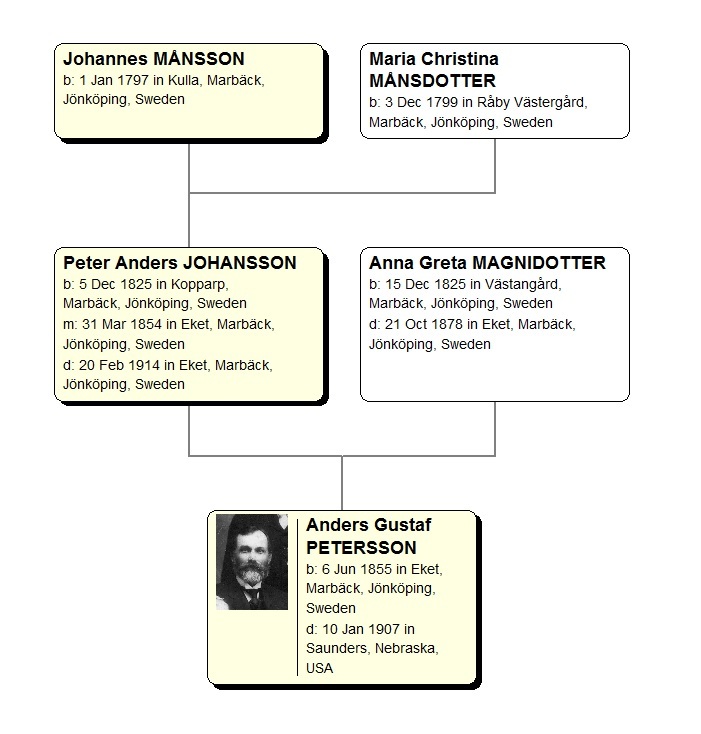 In 1855, Peter Anders and Anna Greta welcomed their firstborn – Anders Gustaf Petersson, known in America as Gust Rudeen. 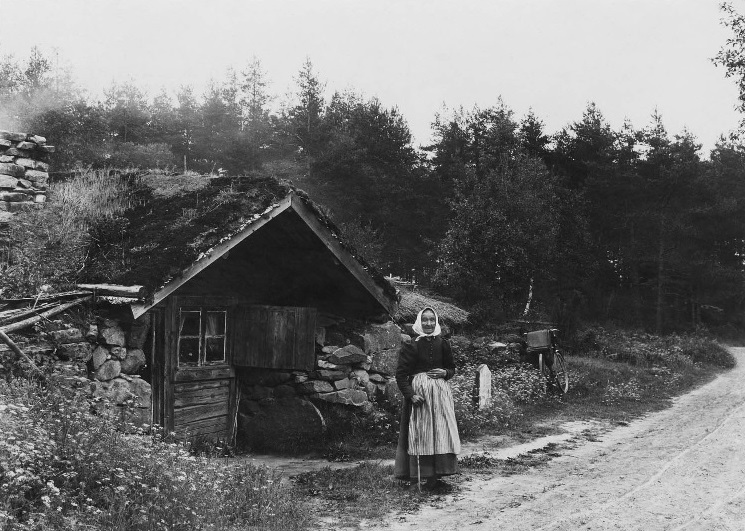 Meanwhile, Gust’s grandparents Johannes and Maria continued to live in the backstuga. I wonder if little Gust enjoyed running over to visit Grandpa and Grandma at their backstuga when he was a little boy? Johannes died on February 16, 1859 at the age of 62 from typhoid fever (can’t tell you how many of my ancestors died of this!). The estate inventory was promptly performed just a couple of weeks later. It is a three-page document that has a preamble and then detailed listings of his assets and liabilities. 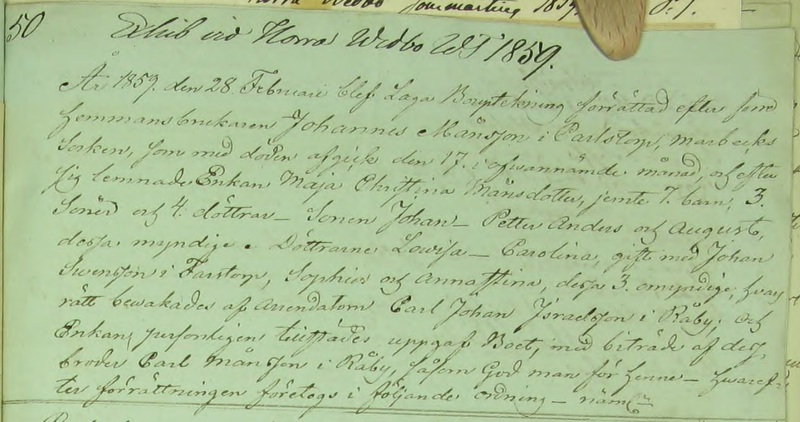 It’s hard for me to make out every word, but the gist of it is that this is the final bouppteckning (probate) for hemmansbrukare (farmer) Johannes Månsson, survived by Enkan (widow) Maja Christina Månsdotter and seven children, 3 sons and 4 daughters. The sons are Johan, Petter Anders and August; the daughters are Lovisa, Carolina, Sophia and Anna Stina. A brother Carl Månsson is also mentioned, I believe this to be the widow’s brother and perhaps he was a witness or executor of some sort. Next time we’ll take a look at what Johannes left to his widow when he died.